I’ve spent so much time here at ITP (especially this week) that I’ve wondered how it has changed through the years. With the help of people that have seen some of the construction and alterations made to the fourth floor, I gathered floor plans from the last ten years. For the Wednesday project, using Flash, I redrew them all and created an interactive floor plan so that people could see how the interior space has changed (through demolished and rebuilt walls and continued reassignment of various spaces). I also wanted to look at the floor plan a bit differently, so I created a map of the actual floor (the carpet, tiles, wood). The link to Floor Plan is below (click on the wood square to see the floor textures). 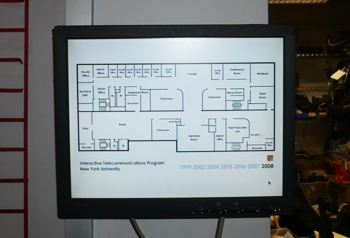 The image below is of Floor Plan on a monitor near ITP’s equipment room (visible on the map). This is great–reminds me of Michael Asher’s show last summer at the Santa Monica Museum of Art. He took all the floor plans from all the shows they had done in the space and put up studs where the walls had been, sort of overlaying all the spaces on top of each other. There were also drawn floor plans available for every show. Check out the 2008 archive at http://www.smmoa.org (sorry, can’t seem to get a direct link). © NYU ITP 4-in-4 » Floor Plan 2010, All Rights Reserved.